This adventure offers nature walks on uninhabited beaches, swimming, snorkeling, and kayaking tours - but watching the whales and wild dolphins in their natural habitat is the most delightful part of this voyage! Humpback whales are regularly sighted in the Bay from December to April, giving us the opportunity to witness these beautiful giants soaring into the air and hear them singing their hauntingly beautiful whale songs. Dolphin encounters are a regular, year-round occurrence in Banderas Bay, and observing Pacific Bottlenose dolphins in their own environment is a great way to truly appreciate these beautiful and intelligent marine mammals, as our fully equipped and comfortable catamarans take you to the shelter of the Marietas Islands, where you can explore the rocky caverns and archways while kayaking, snorkeling or scuba diving. Runs: Daily at 8:30AM from Nuevo Vallarta and 9:00AM from Marina Vallarta from Dec 15th through March 31st. 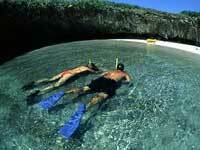 The tour then turns into our Wild Dolphins & Snorkeling Tour. Departs From: Maritime Terminal in Marina Vallarta and the Vallarta Adventures office in Nuevo Vallarta. Directions will be provided with your confirmation. THIS IS NOT A REAL WHALE WATCHING TOUR. THEREFORE WE HAVE DISCONTINUED OFFERING IT. HOWEVER, WE DO HAVE ALL THE BEST TRUE WHALE WATCHING TOURS AVAILABLE FOR YOU! OUR ADVICE: Schools of Pacific Bottlenose Dolphins live in Banderas Bay year round. You are likely to see them on any lengthy boat trip here.